As a craftsman looking for a new vinyl cutter or newbie in the craft cutting game looking for the best vinyl cutter to start with, we’ve curated a list of the best on the market for you in this comprehensive article. You can call it the complete guide to purchasing the best vinyl cutter that suits you. Vinyl Cutting machines have become increasingly more expensive than they used to be and that’s due to the advancements in the level of technology deployed in these vital pieces of equipment. Notwithstanding, it is still very possible to find a good deal in price and quality for the best vinyl cutters. In helping you do that, we’ll quickly start by differentiating between the two distinct markets that exist when it comes to vinyl cutters. The personal (hobbyists/DIY) cutters and commercial cutters. Commercial cutters are for businesses that’ll be using the cutter for intricate designs, signage and for a large queue of demanding projects. Cutters needed by hobbyists are those that are small, easy to use, budget friendly, can be operated quietly, and able to handle smaller projects. When considering which vinyl cutter to purchase, it is safe to assume that the higher the price the better the quality of the cutting machine you get. The most expensive cutting machines usually have the highest qualities. However, you might get a cutter that’s not expensive but will suit your cutting needs so the most important thing is to know your budget and align it with your needs. Considering features, quality, precision, software prices, and PC compatibility, this is your shortlist of 10 of the best vinyl cutter. if a vinyl cutter is integral to any part of your life, be it work, memorabilia or just fun, you’ll value the importance of having to get not just any cutter but the best one to suit your needs. Those that are into sign production and display production industry know that even with the minutest training, a good vinyl cutter can do wonders to the project they undertake and help you improve their businesses. Despite the fact that there are lots of vinyl cutting machines out there on the market, not all of them have the features you require for your own needs. That’s one of the few reasons why choosing a good vinyl cutter isn’t child’s play if you want to get the most out of the one you finally purchase either for your business or for home use. That’s why we’ve prepared this review to help you out. Based on our three-step process , here are the top 10 best vinyl cutter you should consider buying. Update : This section talks about the Cameo 2 , however , we’ve been told that there’s a newer version called Cameo 3. So , what’s the difference between Cameo 2 and Cameo 3? As one of the best tech inclined vinyl material manufacturers for hobbyists and people who use them, Silhouette is well known for their quality products. With most of their machines being electronic, simple, basic controls, Silhouette machines usually come with just enough hardware to ensure you always get accurate cuts at affordable rates. One of their products , the Cameo 2 , is a vinyl cutter meant strictly for that purpose. With an affordable price, the Cameo 2 offers even more advanced features than some other vinyl cutters in its range. Featuring all the necessary things you’ll expect from this kind of machine, be it for basic or complex vinyl printing. Even though there is a newer version called the Silhoutte Cameo 3 , the Cameo 2 still ranks high as one of the best vinly cutter. 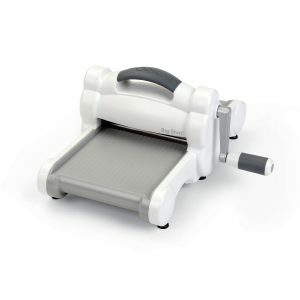 This touch cutting machine is great for business operations with 12×12 inches cutting mat, an extremely sharp cutting blade, and a top notch vinyl trimmer. Coming with the Silhouette business software for free, this product has incredible touch screen power when compared to other vinyl cutters in the same range. Truth is, it is compatible with almost any model or version of a personal computer. It has an AI and CDR file capability, weed line options, multi-cutter functionality and even a matrix copy. It also has tiling features and uses both a USB and power cable to allow you download presets from the online Silhouette store. Weighing up to 11.8 lbs, this vinyl cutter even allows you the freedom of importing your vector designs to the software. Its software, called the Silhouette studio is probably the easiest design and cut software in any available versions. This electronic vinyl cutter makes cuts using super sharp and precise blades. Apart from the need to configure the touch screen with the unit and to attach your storage unit or device, your vinyl cutter is ready to go out of the box. This is an electronic simple and basic vinyl cutter that’s able to handle your projects at a very cool and affordable price. Alongside its pretty easy user interface, you will also enjoy a lot of community support if you decide to purchase this vinyl cutter. It’s worth it. As one of the best vinyl cutters for people who are new to vinyl cutting and for DIY projects, the USCutter MH 34in is a very good tool for cutting, sign making and designing. It even comes with tools and supplies to help you enjoy your product. Some of these supplies include magnetic blanks, squeegee, chart, knife, transfer tapes and vinyl rolls. It features 2-inch adjustable rollers that allow for flexibility as regards working with different materials. The USCutter MH 34in features built-in vectorization tools that are compatible with any major image format you can think of and an image trace feature that is able to convert any of your images into a file that’s ready-to-cut. This cutter is pretty affordable when compared to several other semi-commercial vinyl cutters, plus it has Roland compatible blade holders and uses blades that are easily accessible and economical. This is perfect for small signage businesses and some serious vinyl cutting hobbyists. It comes with a design and cut software making it easy to use. The user-friendly design and cut software gives room for creativity with images, shapes, logos, text and even curves which are ideal for sign making. Even if its major purpose is to be used to cut vinyl, this cutter can be used to cut other materials including craft paper, cardstock, paper, paint mask and standard vinyl. Its ball bearing roller media system means you can cut virtually any size of vinyl materials accurately. 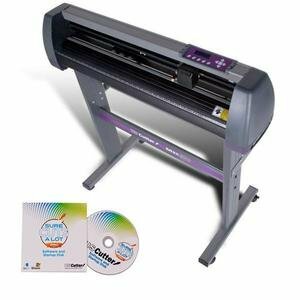 • You can use this vinyl cutter with the USCutter plotter alongside other software’s such as Flexi, Sure Cuts Alot, sign blaster and more. One of the things we don’t like about this vinyl cutter is that it doesn’t do well when cutting intricate designs and that’s because it does not use a laser. Notwithstanding, this is a very good equipment to own if you’re new to vinyl cutting. The Silhouette Portrait is a budget vinyl-cutting machine that offers wonderful cuts for card and sticker makers. This is another great product from Silhouette and it is the ideal cutting machine for you if you’re new in the vinyl cutting space all thanks to its easy to use software and machine. Most Silhouette software is often talked about as basic, but even at that, it is a good one for those that are a beginner. If you’re a crafter and you love creating larger designs, then you should know beforehand that it has a limited cutting size. It’s designed to cut a maximum size of 8×12 inches. Although it cannot cut a very large size of the vinyl material, it can actually cut various types of materials including heat transfer, vellum, magnet paper, wood paper, cardstock and much more. The Silhouette portrait has a feature that Silhouette calls the PixScan technology. This feature allows you to place your image on a special mat that comes with the product, take a picture with either your Smartphone or camera and lastly upload the image to your design software to be cut. With either the Silhouette penholder or the Silhouette sketch pen starter kit, you can use this vinyl cutter to sign cards or sketch designs for wedding invitations. It also has the print and cut mode that allows images to be sent to your printer, printed out in full color and with registration marks. These registration marks are what the machine detects to cut the image when it is inserted in the cutter. However, it cuts very well on the different materials listed above but you might need to reduce cutting speed when cutting some very intricate designs. Weighing just 3.5 lbs, this is a portable, mobile, and accurate cutting equipment. The Silhouette portrait requires a computer to function using the basic edition of the Silhouette studio designer that comes with the package. Although it has a double-cut mode that allows you cut some materials that are heavier than vinyl, it isn’t designed for heavy use. When it comes to the quality of the cuts, even if you have intricate and complex designs this machine will do justice to the cut. Say no more, this vinyl cutter has impressed behind doubts it’s one of the best vinyl cutter on the market. Without mincing words, this is definitely one of the best vinyl cutters currently on the market. With a wide range of features that make cart cutting easier than ever, this USCutter 28-inch will help you get the best results from any of you vinyl-cutting projects. Out of the box, this cutting machine comes with two totally adjustable rollers that ensure you can easily set the width and length you want your cutter to roll at depending on what you are cutting. In the package, you’ll find 3 blades, which mean you’ll not be worrying about getting a new blade for a distant couple of months or even a year. Although a few people might take the stand of the USCutter 28-inch as one of those accessories that aren’t very important, but many vinyl cutter manufacturers leave it out of their products. This means it is a money saver. The USCutter 28-inch comes with an easy-to-use Design Cut software, and a brand new Sure Cuts Alot professional software that helps you enhance your cutting experience. The cutter also works with other popular software through the use of standard Roland drivers and the manufacturers also provide you with a USB cord. The whole package comes with a floor stand, 3 blades, a cover, pen adapter and a USB cord. It allows three connectivity options such as the parallel, USB, and serial but the USB connection is fulfilled through serial conversion. It is able to withstand rugged use due to the good quality materials used in manufacturing it; it is safe to say this is a durable and useful vinyl-cutting machine. This cutter can comfortably cut materials up to a maximum length of about 240 inches. Whatever standards you have, this is one vinyl cutter that’s worth your consideration. Take your time and decide what your needs are, you’ll find out this is worth the investment. For those in the business of designing and making custom t-shirts or the art of craft cutting, they’ll agree that having a vinyl-cutting machine is one of the best and most important pieces of equipment you should have. One way you could do a great job with your cutting craft is to use the Cricut Explore air-cutting machine because even if it has been released since 2015, it is still making waves till now. As one of the most versatile cutting machines on the market, it is capable of cutting a wide range of materials from cards to cloth and most importantly vinyl. 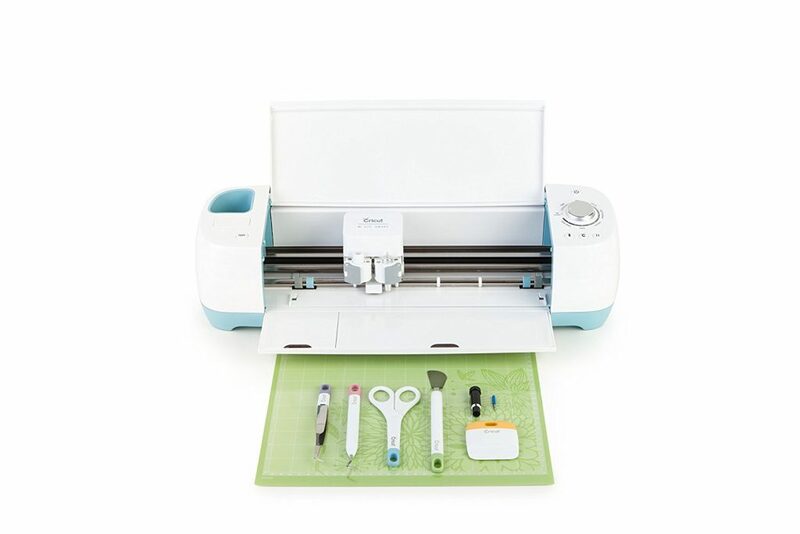 The Cricut Explore comes with various projects and images that you can download to your machine to allow you get started on any project that you will be working on. One of the good things about the free projects and images is the value you’ll get from what you could have paid so much money for. You might think that the free images you get might reduce your need for creativity but the truth is, the Cricut Explore allows you upload and cut your personal designs all for free. With this, you’ll be able to challenge your creative boundaries, edit and even save some of the preset files. One of the hallmarks about the software used by this product is it is forever free and will never require any paid upgrade for you to continue using it at any time. Another thing that makes it one of the best vinyl cutter is that it has features such as amazingly high-quality precision cutting, wireless capability and a very affordable price. The Explore wireless Air bundle comes with a deep cut blade and housing that helps to cut thick materials such as poster board, felt, canvas and even board leather. It also has tweezers, scraper, spatula, and scissors and for real, this is a great choice for you if you’re new to craft cutting. This is definitely one of the most versatile vinyl cutters on the market. 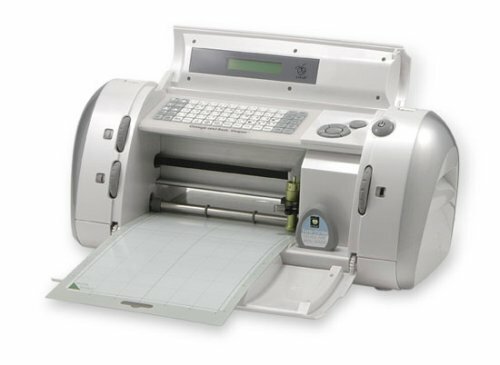 Most scrapbook fanatics would have heard of the Cricut 29-0001 Personal Electronic Cutting Machine. This Cricut is an electronic cutter that doesn’t need to be connected to a computer to function, rather it uses cartridges to perform its functions. The shapes and letters produced with the Cricut are usually between 1 inch to 5 inches and they’re generally used for making scrapbooks. It comes with a limited but decent 1-year warranty and of so many vinyl cutters on the market, this cutting machine has one of the simplest controls that make it easy to use. It weighs only 9 lbs, which means it is very portable and mobile and can be carried around easily to even your scrapbooking events. When you buy this cutting machine, you’ll get as part of the package all the necessary accessories that you need to start your cutting projects as soon as possible including a 16×12 inches cutting mat, a George and Basic shapes cartridge, user manuals and 1 power adapter. It allows you cut everything you need at the touch of a button including shapes, phrases, and letters. It can cut different types of materials like vellum, cardstock, vinyl as well as paper. The cartridges used by the Cricut 29-0001 Personal Electronic Cutting Machine are lightweight and small cartridges that help to cut complete shape or font sets. In using this cutter, all you need to do is to simply place your paper on the included cutting mat and load it into the machine. After this, the next step is for you to insert your cartridge, decide and choose your cutting selection and finally press cut. As a user, you can even control the style and size of the cut using the vinyl cutter’s simple controls. 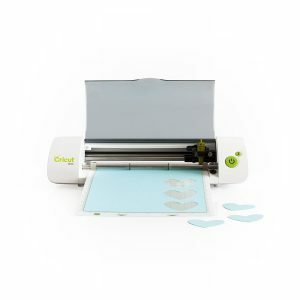 This Cricut 29-0001 Personal Electronic Cutting Machine is a compact, sturdy but very efficient vinyl cutter for papers, scrapbooks, and greeting cards. It doesn’t need a computer to function and that’s a plus for many people. This is one vinyl cutter that has generated raves of different interesting and positive reasons since it was released by Cricut. For those that appreciate silent technology and portability, this is the vinyl cutter for you. It is a small, compact and efficient cutting machine that goes beyond saving you a lot of space to delivering high quality cutting jobs. This is the perfect vinyl cutter that delivers highly detailed and precise cuts. It allows the freedom to easily edit and customize your images to fit any project you’ll be carrying out from time to time and of course, it is very easy to get to know and use this vinyl cutter. It comes included with 4 full fonts, 50 phrases, 150 layered images, and more than 500 digital images. All you need to do is to follow the accompanying simple, step-by-step instructions to help you setup your cutter. You have almost limitless design possibilities at your disposal with the Cricut Mini Vinyl Cutting Machine. Apart from the numerous free resources, you can also purchase other sets of very affordable digital images to help you enhance your project in different themes using the Cricut Craft Room design software. 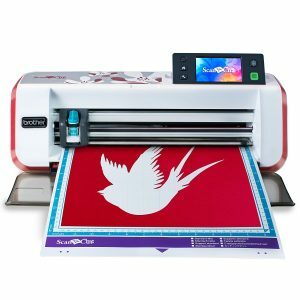 With this vinyl cutter, you can connect to a computer so you can design on a big screen making use of the totally free online Cricut Craft Room design software. This affords you the opportunity to create projects with every Cricut images that are at your disposal, either free or purchased. It comfortably cuts so many types of materials such as vinyl, vellum, fabric, cardstock, chipboard and thin foils in different sizes between 1/4 to 11 1/2 inches. • It’s not so great for larger projects due to its 8.5×12 cutting area. With the Cricut Mini, you don’t have any worries. Just set size, rotate, slant, flip and do anything you want to your image in any way you want. It offers you the easy and fun way to cut with its addicting features. This is for you if you’re cool with editing or creating your projects with a Software. The Brother brand is a very popular name in the printing industry and among hobbyists alike. As one of the biggest names in printing, Brother is known to manufacture quality equipment just like the Brother ScanNCut CM100DM Home and Hobby cutter. Its incredible low price and a host of other features definitely imply that pretty much anyone that knows quality vinyl cutters will drool over it. It is one of the most popular vinyl cutters among its varied bunch of users. This short review is to help you know if the ScanNCut is worth your investment, because we know if you’re here it means you’re probably already interested in this lovely vinyl cutter. The ScanNCut is well known for some features that make it outstanding, especially its ability to print 300 dots per inch (DPI) which is the generally accepted printing standard. It is the world’s first vinyl cutter that has the capability to print 300 DPI built-in scanner and cutter and cam be used in any home. With the ability to scan virtually anything, you can also enjoy the large color LCD touch screen and the about 600 digital built-in designs. It can print on a wide variety of materials including fabric, paper and of course vinyl. It features a touch screen control that makes it possible for users to easily make adjustments and customize their works. Its compatibility with different file formats is also an edge it has over other vinyl cutters and it even as a built-in image converter for some specific types of images. It has an above average scan and cut area of 12×12 inches mat that comes included in the vinyl cutter package. Although if that is not sufficient for your printing needs, a printing mat of 12×24 inches can be purchased for an affordable price. This ScanNCut machine is one of the very few vinyl cutters that is versatile enough to do almost anything you require of it when it comes to printing. This vinyl cutter is in a world of its own. Its popularity is due to the numerous options its users can choose from. Simple, affordable and easy to use. You know what they say, when it comes to your creativity, the Big Shot is a big deal. In that regard, we so not disagree because you can design your own invitations and cards, fashion, quilts, home decor scrapbook pages and altered art using this vinyl cutter. It comes with a stylish and appealing design and its quality and versatility are not also lacking in any way. Like most of us have come to know, Big Shot products usually stand out and this SIZZIX 660425 isn’t an exception. You can perfectly cut and emboss your designs and projects with the precision of a very expensive cutting machine. It can comfortably cut lots of different materials and it comes with a pair of standard cutting pads. More amazing is the extended multipurpose platform that accompanies this beautiful piece of equipment, it grants you access and instant compatibility with the whole Sizzix library including the Sizzix embossing folders and thin dies. This easy to operate cutting machine makes perfect cuts of shapes and embossed textures with just a few turns of the handle. The Sizzix library leaves thousands of different embossing folders and dies at your disposal for you to design for any occasion. The Sizzix Big Shot can be easily shared with friends that need to make scrapbooks, gift tags cards and more due to its portable and mobile size. It can cut a whole lot of different materials including felt, leather, cardstock, foam, fabric, vinyl, vellum, craft metal and flexible magnet. It even as the VT capability to cut multiple layers of thin material at once. It is a quiet and easy-to-use machine that does not require any extensive wrist workout. It is perfect for hobbyists that are looking to immerse themselves into cutting projects or as a worthy gift for any craft lover. This little machine has a huge community and has a 3-year warranty. One major difference between this vinyl cutter and the rest on the list is that it isn’t an electronic cutter, it is simply operated by a crank. With the Sizzix Big Shot vinyl cutter, it is safe to say that you’ll be limited more by your imagination and not the cutting machine. The GRAPHTEC CE6000-40 Vinyl Cutter is one book you can judge by its cover (permit the pun). The quality of this vinyl cutter is instantly evident due to the fact this top of the line cutting machine is capable of extremely small cuts. To get the optimum performance with this machine, you have to use it to know it because it is a professional vinyl cutter. The desktop model features very reliable servo motors that are made for accuracy during production. It also comes with GRAPHTEC’s ARMS meaning automatic registration mark sensor, cutting master plug-in and, GRAPHTEC studio software. 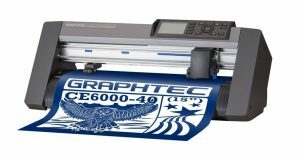 The manufacturers of GRAPHTEC are known to manufacture long lasting and quality machines and the all-new CE6000-40 has not disappointed. It features precision cutting, faster cut time, a swift and accurate digital servo motor. It also comes equipped with the brand new GRAPHTEC studio software that helps to make the process of designing and cutting a breeze. You can use this cutter to produce banners, signs, cut decals, two-dimensional projects, apparel decorations and much more. Amazingly, it also comes with a plug-in for CorelDraw and Adobe illustrator. It features auto registration mark sensor that enhances the cut precision. This cutter and its beautiful electronic design and manufacturing process help to minimize the environmental impact of the hardware equipment. This cutter is reliably known for its capability to cut vinyl film, contour cutting of pre-printed graphics, heat transfer vinyl media, rhinestone design and artwork. This 15 inch CE6000-40 offers a top speed of 24 inches per second and an optimal cutting force of up to 300 grams in any direction. It provides you with vital parameter control which of course includes eight preset cutting conditions all thanks to the built-in front control panel. It even offers some more advanced features such as the down force offset, pin-up speed, blade wear monitoring and tangential control mode. It has a 25 pin RS-232C and the full speed USB 2.0 control interface, this vinyl cutter is very compatible with the latest PCs and legacy computer systems. Seemingly the most costly on the list, any amount you spend on this vinyl cutter isn’t wasted, trust me. 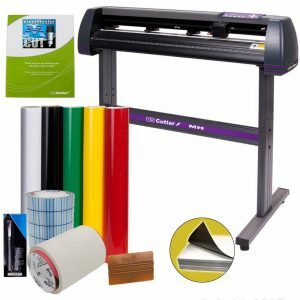 After reading this review of the best vinyl cutter , you’re surefire ready to purchase the best vinyl cutter for your immediate and future needs. It’s time to decide and now we leave it to you to make the decision that’ll help your artisan hobby or business.